ALAN COLMES, CO-HOST: Welcome to Hannity & Colmes . I'm Alan Colmes. Sean reporting tonight from Naples, Florida. Good evening, Sean. SEAN HANNITY, CO-HOST: Good evening, Alan. COLMES: We start tonight with a follow-up to a segment we told you about on Tuesday night's show. A documentary on British television called "Undercover Mosque" exposes the radical rhetoric of some Muslim clerics in London. We have clips we've shown you, and some of them have caused quite a stir. So tonight we have more of these outrageous scenes in this documentary. ANNOUNCER: Money from Saudis has reached some of the best known mosques in Europe, London Central Mosque, also known as Regent's Park Mosque. It's the most recognizable symbol of moderate mainstream Muslim life in Britain. It says it acts on behalf of the whole Muslim community in dealing with the government. The Saudi monarchy gave two million pounds to help build it, and in 19909s they built its educational and administrative wing. The mosque's official book shelf is run by a company called Dar Es Salaam. It's a British company that is linked to Dar Es Salaam Publications, a global publishing house whose head office is in Saudi Arabia. Our reporter visited and bought another video of Sheikh Feiz, the Saudi-trained preacher condemning the nonbeliever. SHEIKH FEIZ: The worst word that can ever be written—a sign of infidelity, disbelief, filth. A sign of dirt. ANNOUNCER: He calls Jews "pigs" who will be killed when the end of the world comes. SHEIKH FEIZ: This creature will say a Muslim behind me is a Jew, come kill him. [Snorting noise] All of them. Every single one of them. ANNOUNCER: Regular interfaith meetings with other religions take place at this mosque, yet in a DVD bought from its book shop, a British based convert called Sheikh Khalid Yasin, who studied Arabic in Saudi Arabia, condemns the teachings of other religions. SHEIKH KHALID YASIN: We don't need to go to the Christians or the Jews, debating with them about the filth which they believe. We Muslims have been ordered to do brainwashing because the kuffar, they are doing brain defiling. ANNOUNCER: The UKIM works with the police and invited officers to its annual conference. POLICE OFFICER: I take huge comfort from the really positive messages from the Muslim community. ANNOUNCER: But in the event which they allowed at their Sparkwood mosque, another invited speaker said Muslims can't join the police. UNIDENTIFIED MALE SPEAKER: Is it correct, is it viable, to join the police? How can you be implementing the laws of kufr? It means a rejection of the concept of democracy, rejecting the entirety of the system. ANNOUNCER: He mentions the Muslim who joined the British army and was killed fighting the Taliban last summer. UNIDENTIFIED MALE SPEAKER: There was an individual who was killed in Afghanistan recently - what was his name? His name was a Muslim name you know what they'd written in a tabloid newspaper? Hero of Islam! A hero of Islam who went into the Muslim Afghanistan to kill Muslims. Why? Because they are implementing Islam. ANNOUNCER: Then he praises the Taliban fighters who killed him. UNIDENTIFIED MALE SPEAKER: He's the one who separated his head from his shoulders. 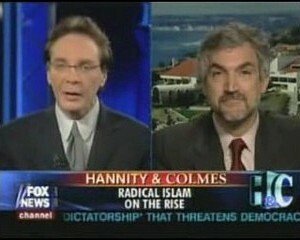 COLMES: And joining us now, the director of the Middle East Forum, Daniel Pipes. Thank you very much for being with us, Dr. Pipes. We had this discussion a few times this week. And I always asked and I'd like to get your idea to it. What percent of Islam are we talking about when we use the phrase radicalism? DANIEL PIPES, MIDDLE EAST FORUM DIRECTOR: In Britain we have a pretty good idea because there have been 10 or 11 opinion surveys, and 50 percent of British Muslims consistently suggest that they would like to see the Sharia Islamic law applied in Britain. That to me says 50 percent of British Muslims are Islamist. That is a very high number. PIPES: I'm not suggesting it. The polls are showing it over and over again, that 50 percent of British Muslims want to replace the current order with Islamic law. In American terms, they want to replace the Constitution with the Koran. COLMES: You think they want to do this worldwide? PIPES: No. The numbers are different in different countries. But in Britain it's extremely high. I don't think it would be anywhere like that in the United States. COLMES: All right. We talk about the threat of radicalism a lot. And we also hear that phrase radical Islam and some of the things that they would like to do. For example, their war on the kind of culture we have in this country. If they are so proficient and they are so widespread, why have we not had more 9/11's since what happened five and a half years ago? PIPES: Because you're assuming that all Islamists want to engage in terrorism. I think in the long-term, what we're seeing here is the radicalization of society, something perhaps more effective than engaging in terrorism. In other words, there are many different ways of establishing Islamic law. One is through violence. Another is through working the system, getting politicians elected, influencing the schoolbooks, working with the media, and so forth. COLMES: If we, for example, go to countries like Iraq and we help create what we call a democracy, and we favor democracy around the world, but in some of those places where the majority decides to vote for Hamas, for example, or for groups or in Iraq, or for example, a constitution says it's an Islamic regime. Isn't that us getting, truly, what we asked for? Democratic governments in some cases, but a majority wants Islam? PIPES: Yes. And my take on that is yes, we do want democracy in the long-term but long-term, we should be approaching it slowly, cautiously and modestly, not the kind of rush that we've seen the last four years. HANNITY: Hey—hey, Daniel, it's Sean Hannity. Thanks for being with us, my friend. I think one of the things we have to emphasize here, which is really, really important, is that this was supposed to be what represented mainstream Islam, where this tape, where this undercover tape was taken here. I think that is a very significant part of the discussion, don't you? PIPES: Oh, very. These are not seedy little mosques somewhere in the hands of extremists. These are the most important mosques in Britain that are being represented, some of the most important preachers. This is astonishing. Really, I've watched this whole documentary, and I was struck by two things that I might point out. One is the utter extremism of what these preachers are saying. And two, once they've been caught out by the Channel 4 "Dispatches" program, their utter denial, saying, no, this didn't happen. I compare it to the man being caught in bed with another woman and saying to his wife, "No, there's nobody here. It's just me and you." It's just utter, flagrant, blatant denial. And what I draw from that is a sense of confidence. One that they can get way with saying these horrible things, and two, they can get away with denying it and no one cares. And in fact, in the two weeks since this program was shown, it's fallen more or less on deaf ears. There's really been few repercussions. HANNITY: But Daniel, as I listen to the comments about Jews, about jihad, about women and subjugating women and the lack of any tolerance for other religions and the desire to spread this form of radical Islam everywhere, as I listen to that and then put it in the context that this is supposed to be mainstream at a mainstream mosque in Britain, I'm thinking, all right, have we fallen asleep? Inasmuch as it seems that the world doesn't want to face the extent to which radical Islam is gaining hold? PIPES: Exactly. We have the same problem in this country, not so bad as in Britain, not nearly so bad, but we have the same problem. One prominent Muslim leader back in 1999 estimated that 80 percent of mosques in this country are in the hands of extremists, of radical Islam. They won't be saying things quite as terrible as what you can see in this documentary, but they're bad. The leading Islamic organizations in this country, whether they're national organizations or mosque organizations or student organizations, are likewise, radical. It is a problem that afflicts the entire West. The larger point is radical Islam is on the ascendant, and moderate Islam is weak. HANNITY: Let me—let me ask this, especially—it's somewhat frightening, the rhetoric, more specifically, the anti-Semitism, as it's so blatant. I guess—what is it specifically when they talk jihad meaning holy war, what specifically are they calling for? PIPES: These preachers are calling for terrorism, military action, subjugation of the kafirs they call them, the infidels, the Muslim term for Christians, Jews and others. It is a very extreme approach. COLMES: Dr. Pipes, we thank you very much for being with us tonight. For more on this radical rhetoric, watch "Radical Islam: Terror in Its Own Words" here, hosted by Edie Hill right here on the FOX News Channel, Saturday at 9 p.m.